Rüsselsheim. Opel is continuing its ongoing product offensive by launching a true all-rounder with the new Opel Combo Life, a wonderful family car full of innovations that makes everything possible. The fifth-generation Combo is based on a new architecture. It is immensely spacious, highly practical and versatile, equipped with one or two rear sliding doors and can be ordered as a short (4.40 metres) or long (4.75 metres) version and as a five or seven seater. 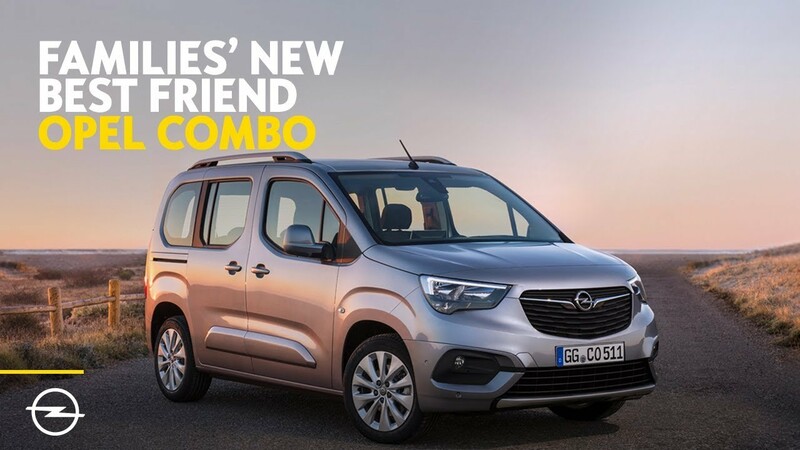 With the new Opel Combo Life, you will be the hero of your local sports team when taking an entire seven-a-side team plus sports apparel to the next match. Your planned family “extensions” can relax on three individual rear seats all with Isofix child seat brackets and enjoy a wonderful view of the sky thanks to the panoramic roof. And your friends will also love the outstanding spaciousness and ask whether they can borrow your new Opel Combo Life for their trips to nearest Swedish furniture store. However, more strikingly the new Opel Combo Life raises the bar in terms of technical ambition in this segment and takes the level of safety and comfort to a new dimension. It is fitted with technologies and driver assistance systems well-known from the compact or SUV segment such as Driver Drowsiness Alert, Rear View Camera with 180° bird’s-eye view, Head up display, IntelliGrip, and comfort features such as heated seats and a heated leather steering wheel. One of the newcomers to the Opel portfolio of assistance systems is Flank Guard. It supports drivers when turning at low speeds. And on top of that the new Opel Combo Life is also pleasant on the eye thanks to bold proportions giving a strong and robust appearance. The new Opel Combo Life significantly increases the number of high-tech safety and comfort features, raising the bar in its segment significantly. Opel recognised the wish of its customers to make high-tech solutions accessible to families and have fitted it with a vast array of technologies that are useful in everyday driving. The Head up display reduces the danger of distractions and projects the most important driving data into the driver’s direct line of sight, reducing the necessity for the driver to take his eyes of the road. Forward collision alert with pedestrian detection and Automatic Emergency Braking helps avoid accidents. The system not only issues an alarm and a visual warning but also brakes independently if the distance to a vehicle moving ahead decreases rapidly and the driver does not react. The Opel Eye front camera known from Opel bestsellers such as the Astra, Corsa and Mokka X. It processes diverse data thus forming the basis for the driver assistance systems such as Speed Sign Recognition and Lane Keep Assist. Automatic Cruise Control adapting the speed to the vehicle ahead if required. Intelligent Speed Adaptation informing the driver when a new speed limit is detected by the Speed Sign Recognition. If the cruise control or the speed limiter is activated, a pop up message in the cluster will ask the driver if he or she wants to adjust the set the speed. Driver Drowsiness Alert evaluates the fatigue level through the drive style and suggests that the driver has a well-deserved break at the next service station. Flank Guard - new to the Opel portfolio of parking/manoeuvring assistance systems. It supports the driver while turning at low speeds, warning him or her when there is a risk that a flank of the car will collide into an obstacle (pillars, barriers, wall or other vehicles). Flank Guard consists of twelve sensors around the car. They analyse the surrounding area and warn the driver via the infotainment screen if a potential collision is detected. The visual warning comes together with an audible one. The Panoramic Rear View Camera, increases the angle of sight at the back of the car to 180 degrees so that the driver can see other road users approaching from either side when reversing. Advanced Park Assist facilitates parking even further. It recognises suitable parking slots and parks the vehicle automatically. It can also exit the parking slot automatically. In both cases, the driver only needs to operate the pedals and shift gears. IntelliGrip traction control, already known from the Opel Grandland X, is an optional electronic front differential which adapts the torque distribution to the front wheels and allows wheel-spin if necessary. This ensures best traction and stable handling regardless of whether the Combo Life is travelling on mud, sand, wet surfaces or snow. The heated leather steering wheel is unique in the segment and ensures that Combo Life drivers will never have to worry about cold hands. The heated front seats keep the chill at bay and increase well-being. The auxiliary heater works independently of the engine and can pre-heat the vehicle before departure. The auxiliary heater can be activated via a timer or remote control creating cosy and comfortable temperatures. The Combo Life also offers Opel-typical state-of-the-art Apple CarPlay and Android Auto compatible infotainment systems with up to eight-inch capacitive colour touchscreen. The fun-factor for occupants is further increased by the various charging options. USB ports in the front and second row ensure that tablets and smartphones can be recharged even while the children watch their favourite YouTuber. A 230V power socket in the front footwell even allows one passenger to plug in a laptop. Furthermore, compatible smartphones can also be charged wirelessly via the inductive charging pad located below the air-conditioning controls. Somewhat more expected than the wide range of high-tech solutions available for the latest member of Opel’s product offensive is its exceptional versatility. It is available as a 4.4-metre long standard version or as a 35 centimetres longer large version, optionally with two sliding rear doors. Both variants have a height of 1.8 metres and both configurations will be available with either five or seven seats ensuring that even large families with their two golden retrievers can enjoy a spacious and comfortable ride. Transporting a large amount of luggage, a considerable amount of sports apparel or even large dogs to a holiday destination will also be a breeze for Opel Combo owners. The five-seat, standard length version has a minimum luggage volume of 597 litres. People requiring even more space can obviously also opt for the long wheelbase with a minimum luggage volume of 850 litres3. However, the Combo Life is not only a spacious and highly comfortable family van. It can also double as a small transporter. With the rear seats folded down the boot volume of the standard version more than triples to 2,126 litres meaning that getting camping equipment, bicycles or large parcels from A to B is no longer a problem. Again, the longer version of the Combo Life offers even more capacity when the rear seats are folded down. In this configuration, it can carry a whopping 2,693 litres4. Furthermore, the developers have also thought about how to transport long items. Therefore, the front passenger seat folds flush with the rear seats, extending the length of the loading area so that even surfboards can be transported. The designers also ensured that the annoying gap sometimes left between luggage and tailgate can be utilised thanks to the optional opening window integrated in the tailgate known from premium SUVs. The second row seating setup of both variants also caters for individual preferences. Customers will be able to choose between the standard second row bench with 60/40 split or alternatively three individual seats, which can be folded conveniently from the boot. In both cases, each seating position has its own Isofix child seat bracket as standard allowing for three child seats to be fitted next to each other, a rarity in the market. Furthermore, each seat has a top tether anchor point designed to lessen forward movement of the forward facing child seat in the event of a frontal collision and thus reduce the risk of injury. Meanwhile, easy access to the passenger compartment is guaranteed by the sliding doors. Regardless whether children or adults are travelling in the rear, all of them can enjoy a wonderful view of the sky thanks to the optional panoramic roof. It permits them to savour starry nights or lap up the warm rays of the sun. When the sun is too strong for the occupants’ liking, an electric sunblind, activated though a switch in the overhead console, can be closed, providing total protection. When open, the panoramic roof also improves the feeling of space even further while simultaneously creating a pleasant and light ambience. The storage possibilities of the Combo Life match the versatility of the vehicle and are benchmark in the segment. The large compartment in the centre stack can take anything ranging from 1.5 litre bottles to smartphones or from wallets to tablets. In addition, front and rear seat occupants can safely stow items in the large door pockets. Passengers in the rear can keep their tablets safe in the pockets on the back of the front seats while the driver and front seat passenger can use either the top or the lower glovebox. The top glovebox is ideal for larger items as it is particularly spacious thanks to the installation of the passenger airbag in the roof. But that is by no means all. When ordered with the optional panoramic roof, the Combo Life comes with overhead storage running down the centre of the vehicle with LED lighting as standard. Furthermore, in this configuration the newcomer is also fitted with a large 36-litre storage box mounted above the hat tray in the boot. This enables for some of the space normally not utilised when not packing up to the roof is used sensibly – without impeding the view of following traffic through the rear view mirror. The storage box is ideal for clothes, books or small toys such as the favourite teddy bear. It can be loaded from the rear when the boot is open or via the optional opening window integrated in the tailgate and accessed from inside the vehicle via two sliding doors at the front of the box. Those in need of even more space and even more storage possibilities or those who want to tow a small caravan (trailer load up to 1,500 kg) can obviously also attach a trailer via the optional fixed or removable towing hook. To ensure the safest possible driving conditions, the Opel Combo Life comes with Trailer Stability Control (TSC) as standard when ordered with a towing hook. This additional ESP function stabilises the swaying of the trailer or slows the vehicle as required. If these measures are not enough to avert all danger, the system reduces engine torque even further and brakes the vehicle so that the critical speed range is left as quickly as possible. The new Combo Life does not just stand out from the crowd with its high-tech solutions, outstanding spaciousness and exceptions versatility. It also comes with eye-catching proportions. Compared to other cars in the segment, it has a shorter front overhang and a higher bonnet. It looks more balanced, robust and confident. From the front, it displays a typically Opel identity with sculptured details enhancing the feeling of precision and solidity. The high bonnet with two crisp lines, which go from the windshield down to the grill, emphasises the stability of the vehicle. The predominant part of the car is the front grille, where the headlamps with LED Daytime Running Lights with the typical Opel winglets band together precisely and amorously as a defined line. Two chrome wings in the grille embrace the Opel Blitz. Thick wheel-wells connected via the side sills further emphasise the solidity of the Opel Combo Life. The rear of the car is very linear following a vertical design underlining the high practicality of the vehicle and framing the generous opening to the luggage compartment. In the interior, driver ergonomics have played a decisive part resulting in a well-organised cockpit where all the controls are easy for the driver to find and reach. The centre console is clearly divided in three different areas. In its upper part, the infotainment system takes up most of the space. Down from there, the driver finds the heating and ventilation controls and in the lower part there is adequate storage space for a 0.5-litre bottle. Chrome accents on the steering leather wheel, on the door handles and in the air vents add further character. Under the bonnet, Opel Combo Life customers will have the choice between a variety of turbo-charged, direct injection petrol and diesel engines. All of the units combine driving pleasure with a high level of fuel economy. The engines are mated to five or six-speed manual transmissions with a segment-first eight-speed automatic option also being available.